Samsung started 2019 with a bang, by unveiling the India-focused Samsung Galaxy M10 (review) and Samsung Galaxy M20 (review) smartphones. 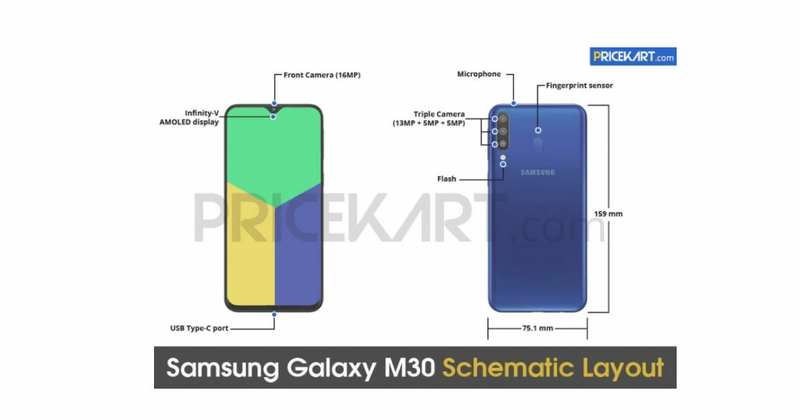 But the company isn’t content with that, as leaks and rumours about the third offering in the M series — the Galaxy M30 — continue to pour in. As the nomenclature suggests, this phone will be even more powerful than the other two handsets, and we expect it to be placed in the Rs 15,000 price range. So if you are wondering what this device might bring to the table, then we’ve rounded up all the rumours and speculations at one place. Let’s begin. It’s being said that the upcoming Galaxy M30 will carry a 6.38-inch display with a full HD+ resolution on its front. It will, of course, come with a teardrop notch, which is part of the new Infinity-V display introduced by Samsung with the M range. A recently-leaked schematic of the phone suggested that this panel will be Super AMOLED in nature, but there has been no other report to support this claim, which is why we’d advise you to assume that it will be a TFT or LCD panel as the M10 and M20 also feature the same. What we can say with utmost confidence is that the Samsung Galaxy M30 will ship with a triple camera setup on its back. Samsung has till date only reserved this hardware choice for its upper mid-range handsets, but it’s for the first time that three cameras will be seen on the back of a sub-Rs 20k phone. The trio apparently consists of a 13MP f/1.9 shooter, a 5MP f/2.2 sensor and another 5MP f/2.2 camera. One can assume that the two additional cameras will allow wide-angle and portrait photography. However, the Galaxy M10 and M20 already have both these features with just two cameras on their backs. Which does suggest that Samsung could use the third sensor for offering optical zoom. Since the Galaxy M20 carries a 5,000mAh battery inside it, there’s no surprise that the rumours about the M30 too mention a capacious cell. The massive pack will help the phone run for two days with moderate usage easily. Moreover, 15W fast charging support with a bundled charger is also likely to be deployed for this handset. Earlier reports had hinted about an Exynos 7885 chipset having made its way into Samsung’s Galaxy M30. However, the latest leak has suggested that the improved Exynos 7904 unit will be powering the device. The chipset comes with a 1.8GHz octa-core processor and Mali-G71 MP2 GPU. 4GB of RAM and 64GB of storage are most likely to be included in the base model, but there are some murmurs about a 6GB RAM model with 128GB of storage too. The design of the Galaxy M30 is expected to be very much similar to that of the other two handsets in the range. You will be getting a 3.5mm socket at the bottom and a fingerprint scanner on the back. And just like the M20, this phone too will come equipped with a USB Type-C port for offering fast charging support. On the software side of things, we can expect the device to ship with the new Samsung Experience UI, though it remains to be seen if it’s layered atop latest Android 9.0 Pie or previous-gen 8.0 Oreo. The Samsung Galaxy M30 is expected to debut in India sooner than later, but there’s no confirmation yet. We’ll keep bringing you all the updates about this handset in the meantime, so keep watching this space.